The 30 day challenge is over. Just to recap, or for those of you that aren’t aware, this involved two parts. The first was to practice my hand balancing in one form or another every single day. To be honest, in this regard I failed. I missed a couple days at the end. This was a result of getting busy, putting off the practice and forgetting to do it later. But I don’t think of this as a failure. What I did accomplish was to practice my hand balancing almost everyday. I’m back into it with renewed vigor. Progress at gymnastics is coming fast. Back to tumbling with a fury. Gained back my old skills fast and moving onto the new. In addition I’ve begun working on the other apparatus like the parallel bars, pommel horse and more. And I did see improvement in my one hand handstand and one arm half planche (my two big hand balancing goals right now) over the month. They’re still a long way off but no one said you could master these moves overnight. In fact, most people say it’ll take years if you even ever accomplish the one armer. The second part of the 30 day challenge was to post on the site every single day. While it was difficult at times I did accomplish this one! Lots of pictures, a wide range of videos and short helpful tips are all there to see. Not to mention holding a sale and releasing a new training tool during this time. I would say it was a great success. I’m going to go back to writing to you once or maybe twice every week. And the good part is this will be a more in depth piece then what I’ve been putting up lately. I will continue to practice my hand balancing regularly and report on my progress here. If you did the 30 day challenge with me, I’d love to hear about how it went for you down below. Mark apparently got this move from me (and I got it from Professor Orlick in the Hand Balancing Mastery Course), but the way in which he does it was new to me. Once you get into a handstand move your hands in closer to a touching position, and then from there you move them even closer so a hand is on top of the other hand. This in many ways mimics a one hand handstand as you’re lessening your base of support. A great lead-up stunt. The difference is I had always kicked up into position with the hands closer or on top of each other, rather than moving them in. I have to say I like this one a bit more after having just played around with it, although both ways are valid. In my working towards a one arm handstand I’ve figured out that the amount you must lean over your hand is quite significant. Even more than you may think is necessary. Without this lean you won’t be able to get into a balance. So if you’ve been working towards this skill like I have, try leaning even more to the side, to the point where it feels like you’ll fall over that way. Right at that point is where you’ll be capable of balancing. If you look at a bunch of one handed handstand pictures you’ll be able to notice the balance point of where people are at. You can then tell if they’d be able to hold the position of are about to full right out of it. Just a short tip for today. With all the wide variety of hand balancing skills you can possibly do what should you focus on? This is the topic of one of the eight special reports found in the Hand Balancing Mastery Course, but I’d like to give you a few details on it now. The more time you spend practicing the more skills you can focus on. In fact, you’ll need to spread that time out into a variety of moves. This may be obvious but it is nevertheless important. If you don’t practice very often or for very long you’ll be better off just focusing on a single skill or two. Now this may involve doing several assistance or lead-up stunts that will the main skills. But its all in the efforts for just one goal. That’s the other big part of what to focus on. It depends on what you want to accomplish. I believe simply by having a goal, especially with a deadline, you’ll make progress probably twice as fast. That’s it for today. If you don’t have a set goal why don’t you figure out what that is and write it down. Then figure out the best way to approach it. My goal is to hold a one arm handstand with real balance for at least five seconds by the end of this year. What’s yours? This is the second in the series on progress towards the one arm handstand series. In the Secrets of the Handstand Quick Start Video I show four lead-up stunts that work the skills necessary to do a handstand. The one arm handstand has lead-up stunts too. As was discussed previously in part 1, the most important lead-up stunt is to build a stable and consistent handstand that you can hold with ease. Only once you are at this point should you begin work towards that one arm version. Just like for the regular handstand, a handstand against the wall can be used. In using it to lead-up to the one arm handstand, you’ll obviously do it on one arm. This can help to build your strength. Plus you’ll be able to work on your position, to make sure you get exactly as you want. This is excellent as I find in my practice that as I fatigue it becomes harder to stay in the locked out position. Much easier to work on building this up without focusing on balancing, by using the wall. With a stronger position you will be able to practice longer and more. When you do that one arm handstand against the wall you should do it in the same form as you’ll be working on the balance. If your legs are spread, do it legs spread. If you’re working on the one hander with legs together, do that against the wall. Try to minimize your lean as much as possible as you strive for the best position. Being able to hold the one arm handstand against the wall for 45 seconds to a minute is a good goal to shoot for. This is one important step in the journey towards success. P.S. Want more help for the one arm handstand? 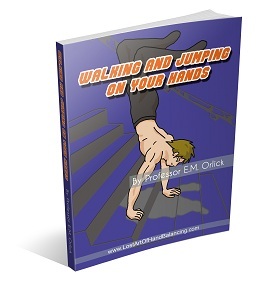 Be sure to check out How to do the One Hand Handstand by Professor Orlick. My current goal in hand balancing is to do the one arm handstand. Its been a goal for a long time. On that note I’m going to start a new series of articles that detail my progress toward it. This series will be off and on as I try new exercises, have breakthrough’s and make progress. There will be no known end point and no regular schedule to these, but they‘ll come when they come. Before I get to that though we need to start with the preliminaries. Where should you be at in your hand balancing practice before you begin in the one arm handstand? “He who cannot walk can hardly run, and it is equally true that one who cannot do a correct two hands balance can hardly hope to master the balance on one hand. And by this term I do not mean mere ability to stand on the two hands; I mean the ability to stand in good position and to remain there by balancing correctly. So, before making a pass as the one-hander, check back on your two hands position. “YOU MUST FIRST MASTER THE TWO-HAND HANDSTAND. That’s right! You cannot possibly do a good One-Hand Handstand until you can do a perfect Two-Hand Handstand. “This does not mean that you must be able to perform all of the hundreds of tricks in my basic course “Handbalancing Made Easy”. It simply means that you must be able to press into a perfect Two-Hand Handstand and hold it with absolute control. It means that your elbows must be straight and locked, that your shoulders must be stretched out and locked, that your back must be only slightly arched, your knees perfectly straight and your toes pointed. “When your shoulders are fully stretched out, you shoulder muscles (deltoids) should actually be pressing against your ears. Furthermore, there should be a straight bone-to-bone alignment at your elbow and shoulder joints so that no strength is needed to support your bodyweight. When you get into this fully locked-out position, with every part of your body stiffened out into a straight line from your hands to the very tip of your toes, then you will be able to hold the Perfect Two-Hand Handstand with practically no effort whatsoever. In fact, all that it will require to keep you up there is the slightest bit of pressure against the floor with your fingertips. “The fully locked-out position in the two-hand handstand, is the half-way mark to the One-Hand Handstand. This is the position you must assume every time you want to go into the One-Hand Handstand. In fact, this is so close to the One-Hand Handstand that you can’t get much closer to it without actually doing it. While there is disagreement about the back-bend the rest of the details are similar. Before beginning the one arm handstand you need to be able to hold a handstand with ease in good position. If you can’t do this, your efforts towards the one arm handstand are going to result in nothing but frustration. This is getting me excited to work on my position more right now. Next time we’ll look at some other important lead-up stunts before beginning in earnest with the one armer itself. In my last post on juggling I talked about the differences between learning most skills and that of hand balancing. The biggest difference being that hand balancing takes a lot of strength and endurance. People talk about having the proper position which places the stress along the structure of the body versus using your strength to hold yourself up. This is true. Building endurance holding this position against the wall allows you to train more when trying to learn the balance. But either way you will only be able to hold a handstand so long. What can you do to increase this time? While holding a handstand out in the open is largely a matter of balance, you know once you get past a certain point fatigue starts to set in. By working to increase the time you can hold a handstand against the wall you can increase your endurance overall. You should be able to balance and hold a freestanding handstand longer with more endurance. But the main benefit is you’ll also have the endurance to train longer with greater effectiveness. So even if you are working on balancing, still spending some time against the wall to improve your endurance will benefit you. This applies to more than just the basic handstand. Why not try the same thing with the one hand handstand? Of course, as going for long timed holds against the wall is fatiguing you’ll want to do these at the end of your practice, not at the start. The same can be said of handstand pushups. Are you working on presses and freestanding handstand pushups? Make sure you have adequate strength to work on the skills of the movements. And to do that increase your reps and follow the progressions laid out in The Ultimate Guide to Handstand Pushups. Work to increase your skills. Work to increase your endurance. Both lead towards the same goal.